Well trained and experienced crew. Book directly from tour providers. Instantly receive your tickets on email. 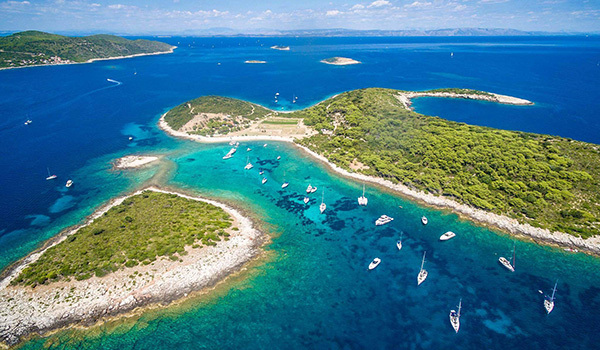 Spend a full day on the sea, visit some of the most beautiful Croatian islands and testify to the natural phenomenon of the Blue cave on the Bisevo island. Sounds better than spending a day in a hotel room or a local bar? - We thought so! 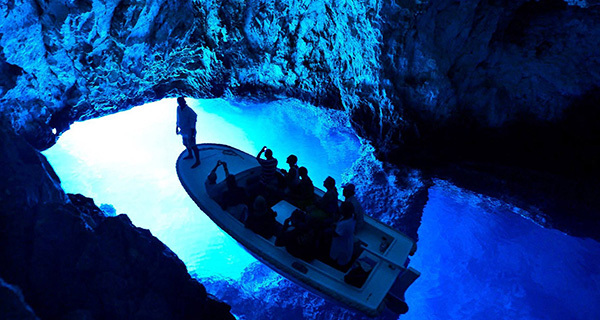 Now book your tickets and let the Blue cave tour from Split or Trogir become a highlight of your visit to Croatia. 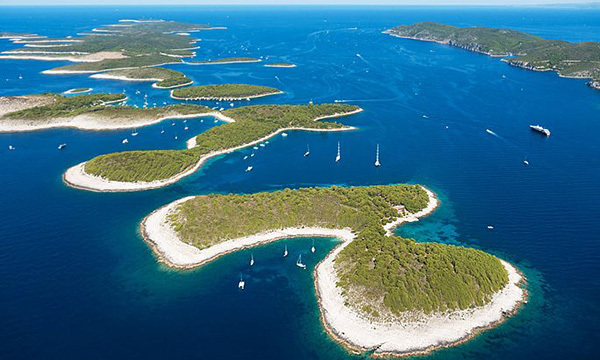 Explore 5 beautiful islands (Bisevo, Vis, Budikovac, Paklinski and Hvar island) in a single day. It would take you a week to visit all these islands by the ferry. Enjoy a comfortable ride in small groups on our brand new speedboats. Each boat has two crew members: professional skipper (driver) and a hostess. Each ZenTravel crew member speaks English. 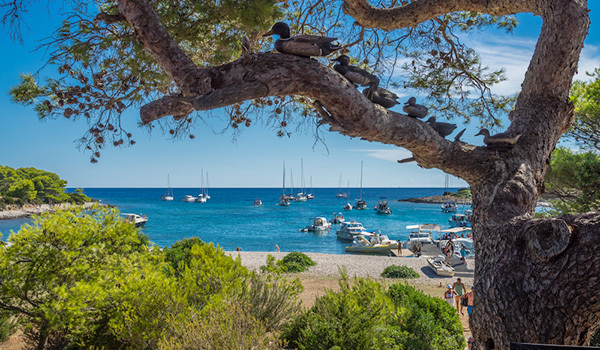 Discover Blue Cave, swim in a Blue Lagoon, visit small island towns and lots more. 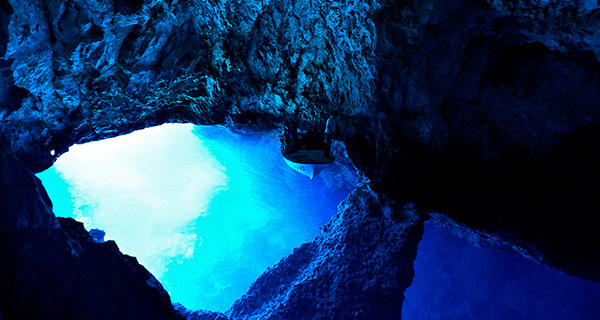 The Blue Cave Tour From Split is one of the most popular day tours in Dalmatia, for a reason. 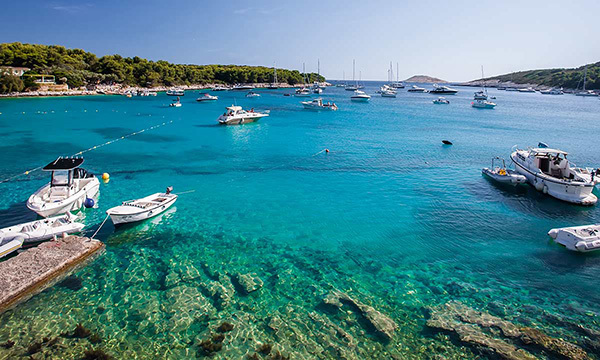 Meeting up early in the morning allows us to avoid crowds and enjoy the natural beauties Croatian islands have to offer. Before we depart, you will have opportunity to meet your travel guides and hear brief info about what to expect on the tour. You will also be introduced to a proper way of getting on/off the boat, and use of safety equipment. 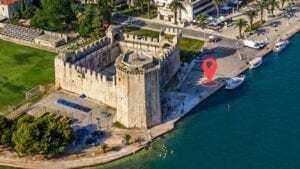 Once we depart, it will take about 1 hour and 15 minutes to arrive on the first destination of our Blue Cave Tour From Split and Trogir : Bisevo island. The reason we're here and the main highlight of the entire tour is the Blue cave, which is located on the southeastern side of the island. Upon arrival, our hostess will head to the sales office and buy you tickets required to enter the cave. Once tickets are bought, all you need to do is to wait for your turn to enter the cave. 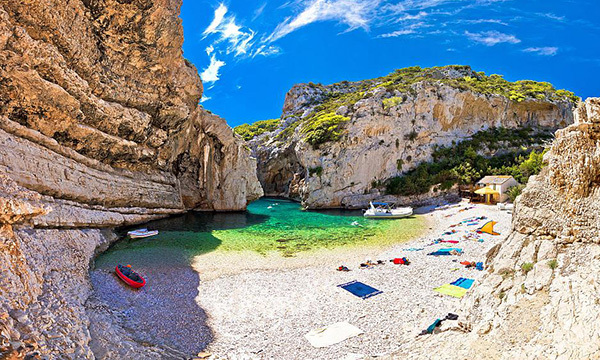 Stiniva, authentic Croatian beach located on the south side of Vis island has been voted for the best beach in Europe in 2016. There is no doubt it is beautiful, with its dramatic enclosure of massive limestone cliffs giving it some special aura when you first enter this hidden bay. There is no better place to immerse yourself within natural Croatian beauty than Stiniva. In past 10 years, Stiniva became busy, and when I say busy - I really mean it! 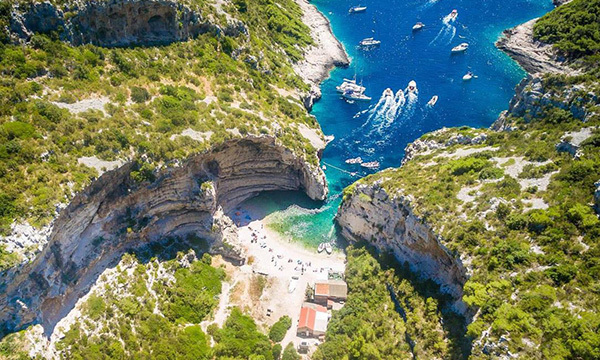 Hundreds of speedboats are entering Stiniva bay daily. That is main reason why we won't spend much time here. We will do a 15 minutes sightseeing, without swimming. 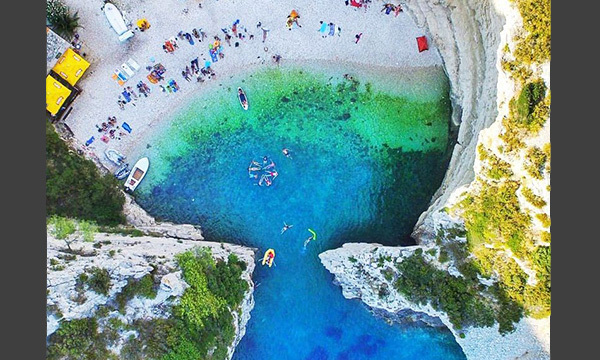 Don't worry, we have found even better locations for swimming ! At this point we have already seen many amazing places created by the sea, and now it is finally time to experience it as well! Swimming and snorkelling in a crystal clear sea is something you'll appreciate during hot summer days. 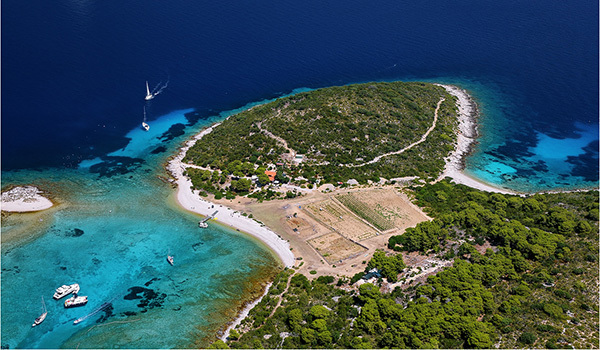 Snorkelling equipment is provided by us, so, take a deep breath and start exploring the Blue Lagoon on Budikovac island! 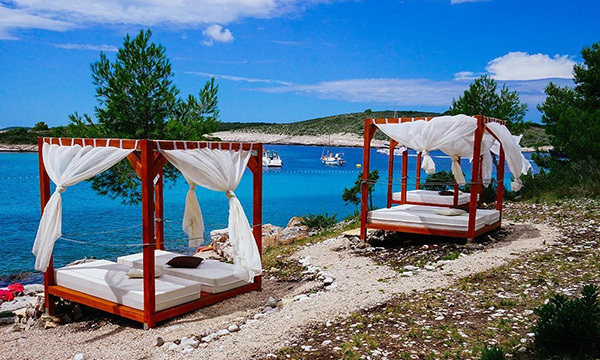 There is also a beach bar that offers you an opportunity to refresh yourself with a cold drink. It's time for a 4th island (actually, group of islands) on our to-go list. This time, we're jumping off the boat to the Paklinski islands. 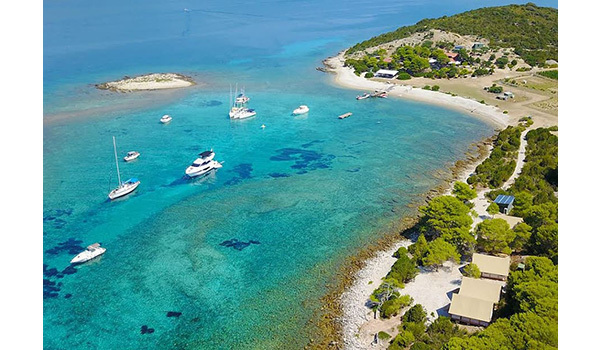 Here we'll spend approximately two hours, which means you'll have enough time to explore the islands, enjoy its beaches or enjoy the shade of the trees to hide from the sun. It's your choice ! Also, it should be mentioned, there is a beach bar and a restaurant on the island which will be convenient for those of you who are hungry. 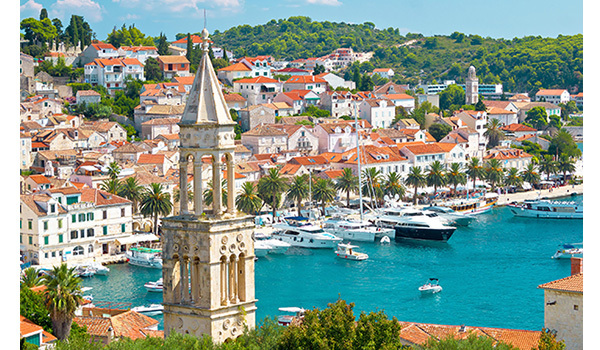 Finally, the sunniest island on the entire Adriatic sea : Hvar ! 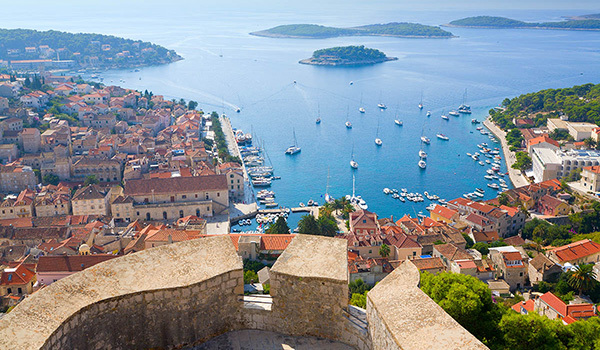 The Blue cave tour from Split wouldn't be complete without visiting the Hvar island. But, once you are on the island, it is important to spend your time wisely. Walk around, see how the locals live and many more. 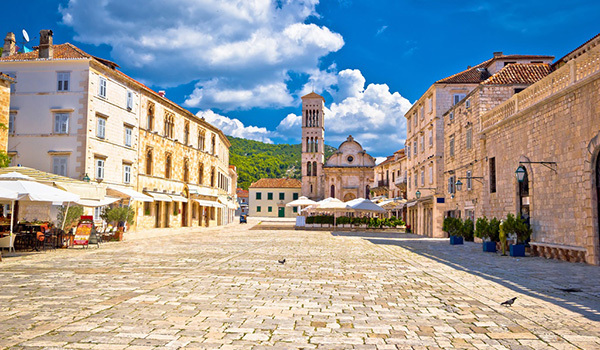 Once we all meet in front of the boat, it is time to go back to the place where everything started - Split and Trogir. 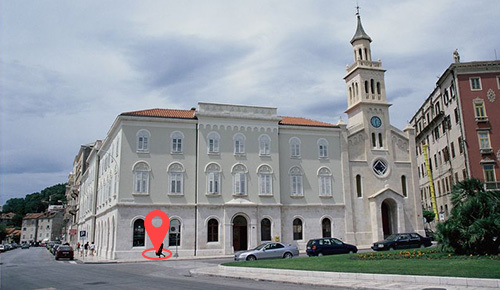 It will take about 1 hour to return to Split, and extra 15 minutes to arrive from Split to Trogir. After sharing group photos, tagging each other on the social media, it is time to say goodbye. Hope to see you soon on some of our other day tours ! Since 2014 swimming in the Blue cave is not allowed. We'll spend approximately 15 minutes driving through the cave in a small wooden boat. Please, be quiet and carefully listen to your guide who will tell you everything you need to know about the Blue cave and its history. If weather is not good, speedboat ride will be a little bumpy. For this reason, the tour is not recommended for persons with back/neck problems and pregnant women. Due to the weather conditions, the Blue cave might be closed occasionally. If this happens, we will notify you at least one day before the tour departure. When the Blue cave is closed you can choose from 2 options : full money refund or re-scheduling your trip for some other date. Two meeting points are possible for this tour. Please select your preferred meeting point during the checkout process. Please select your starting city (meeting point) during the booking process. You can cancel your tickets up to 24 hours in advance and you will receive a full money refund. "Extra destination instead of waiting in the line"
We came to the Blue cave and it was packed! Our host Ivana hopped off the boat to wait for our tickets and skipper decided to take us to the Monk seal cave so we can swim there and have fun instead of waiting in the line for the Blue cave. After an hour or so we boarded on the boat and came back just right in time for our turn. What can I say, you must see the Blue cave, it's that good. Nice job guys, you took a good care of us! 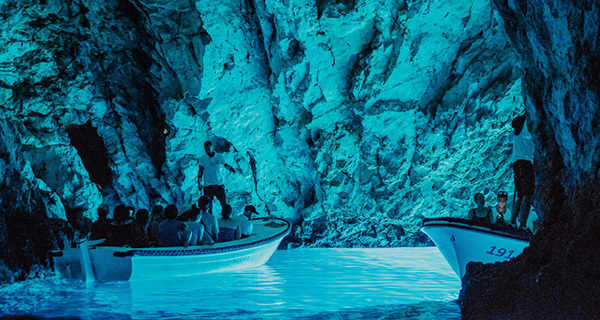 My husband and I took ZenTravel tour to see the Blue cave, so amazing by the way, but we didn't know that skipper will take us to the locations on the island of Vis where Mamma Mia was filmed! I got goosebumps when I first saw somehow familiar location and when skipper told us that those were spots where it was filmed I almost screamed out of the excitement. Thank you so much ZenTravel on this awesome surprise! © 2018 COPYRIGHT ZEN TRAVEL D.O.O. 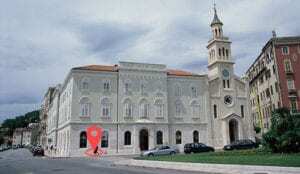 BANK : Splitska Banka d.d.